The walk is based on the original leaflet produced by the late Gordon Mills in 1998 and was first published on this site with his permission in the same year. The text here has been amended to include the addendum changes published in partnership with Marple Local History Society but has not yet been fully updated as part of our longer term programme to ensure that these historic guides remain available for people to enjoy. An additional photo from the Virtual History Tour has been added. 1) Our walk commences at the car park adjacent to Rose Hill Station. The entrance to the Middlewood Way is clearly signposted just to the left of the council depot. The Middlewood Way runs along the former L.N.E.R. route to Macclesfield which closed in 1970. Follow the path as it makes its way under the Rose Lane bridge and then past the works on the left. Shortly after, the Way widens out onto the Wood Lane car parking area. Carry straight on passing the school and rugby clubs playing fields on the right. A short distance after the last of the houses on the left is passed you will see a stile on the left that you will cross towards the end of the walk. Carry straight on with Marple Golf Course on the left. Some 200 yards further on the path has a slight kink in it and it is here, on the right, that a picnic area has been provided. 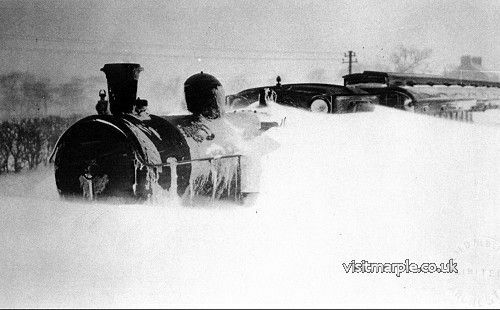 Trian stuck in snow drift during winter of 1947 viewed from Torkington Road bridge. Just after the wooded areas on the left and right, the Way enters a cutting with a bridge taking Torkington Lane over. It was close by here in the harsh winter of 1947 that a train was stuck in a snowdrift for several days, leaving the passengers no alternative but to walk the last mile to Rose Hill station. Torkington Lane then runs alongside the Way for a short distance before turning off towards Hazel Grove. Pass over the crossing where a track on the right leads to Torkington Lane and continue straight ahead for about 200 yards. 2) Look out for a stile on the embankment on the left. Cross this stile and make your way across an open field with views towards All Saints Church and the Goyt Mill. Cross the next stile into a small paddock and over another stile. Bear slightly left and make your way to cross a stile by a metal gate. Proceed onto a farm track which bears away to the right. Follow the track and over a stile by another metal gate and past the riding stables of Higher Fold Farm. 3) On reaching the road from Marple to High Lane cross over and through an opening to the left of the wooden gate, signed Macclesfield Canal. Follow the track until you reach the canal bridge. 4) At this point you have a choice, either turn right and go down and under the bridge and follow the towpath or cross the bridge and over a stile on the left to a path running between the canal and the deer farm on the right. As the canal bears to the left this path veers to the right and joins the farm road. Turn left and then left again. When you reach the canal bridge follow the path down to rejoin the towpath. After about 200 yards you pass under Clough Bridge taking the main road to High Lane over the canal. After a short distance the canal bears left and enters a long straight section to the next bridge. 5) This is Barns Fold bridge leading to Marple Golf Club. As you pass under the bridge notice the marks caused by the ropes of the thousands of horsedrawn narrowboats that passed this way. Most of the bridges had a metal roller to reduce the wear but for some reason this bridge was missed and has in consequence the most scarred stonework of all the 98 bridges on this canal. The Macclesfield Canal was surveyed by Thomas Telford although the construction was under William Crosley. It was one of the last canals to be built, being completed in 1831 only a few years before the railway era began. In 1846 it was purchased by a railway company who ran it profitably for many years before a rail link was finally built in 1869. Even then it was still used well into the 20th century as the railway and canal were owned by different companies. After the bridge the canal bends to the right and ahead can be seen the Goyt Mill built in the early 1900s. Since its closure it has been converted into small units and now houses over forty businesses. On the left is Marple Golf Course which you will be crossing shortly. 6) About 100 yards before the bridge go through a gap in the hedge. Unfortunately the path across the golf course at this point is rather indistinct so to assist you the photograph below has been marked with a white line to give you a rough idea of the direction to take. The path is adjacent to what originally was a hedge. Before starting look to your left to make sure that any golfers on the nearby tee are not about to play. In fact keep your eyes skinned all the time both to the left and right as you cross several fairways. After several hundred yards you will reach the safety of a wooded area and there are a couple of signs to direct you on your way. After the second sign keep close to the edge of the valley on your right until it takes a route to the right of the third tee. Within about 100 yards the path plunges into a pretty wooded section on the edge of the golf course for several hundred yards before emerging back onto the course. Follow alongside the holly trees for a further 100 yards to rejoin the Middlewood Way. 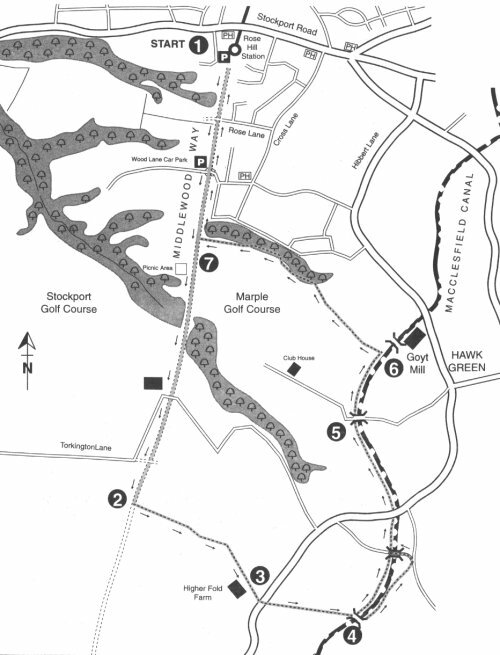 7) Turn right and follow the trail half a mile back to the car park at Rose Hill.